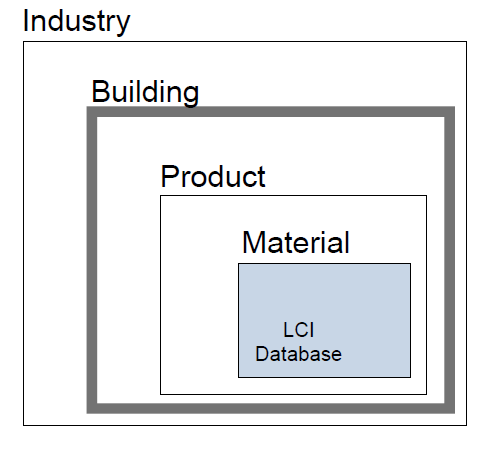 The LCA methodology as it relates to the building industry can be pictured as operating at one of four levels: material, product, building, or industry, as shown in the diagram below. Each larger level builds from the level below and expands from the material kernel. At its core, process-based LCA is defined at the material level. The question “What is a material?” seems straightforward, but is not. Both cement and concrete are building materials, but cement is a constituent of concrete. The environmental footprint of Portland cement is significant, due the extraction of precursor minerals from the earth and the energy necessary to create the Portland cement clinker. An LCA of a given concrete will depend on the percentage of cement that is included in the concrete and whether fly-ash is used as a substitute for cement. In addition, the location of cement production relative to the building site will have a significant impact on the LCA outcomes. 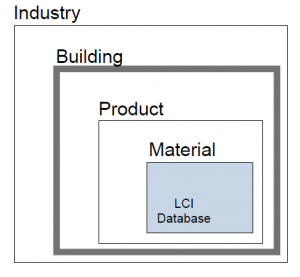 Material-level LCI data is calculated by process chemists, chemical engineers, and associated specialists and submitted for inclusion in various LCI databases. There is some direct use of material-level LCI data by building professionals, however. If one wanted to calculate the positive impacts of using fly-ash as a substitute for part of the Portland cement in concrete, this calculation could easily be made by directly accessing data from the LCI database. At the product level, an LCA is calculated as a collection of materials, which are assembled into a final (or intermediate) product. A quantity takeoff of the product is completed, and the emissions from each component of the products are summed. The product LCA of a heat pump would include the production of the pre-cursor materials—steel, copper, aluminum, plastics, refrigerants—plus emissions from galvanizing processes, painting, metal fabrication, welding, etc. To complete a product LCA, thorough knowledge is required of the source and quantities of materials and the manufacturing processes of the finished product. Building LCA, or whole-building LCA, can be thought of as a product LCA writ large, where the product is the building. In this case the LCA expert should understand how the building is constructed, how building materials and products flow to the jobsite, and how the building is going to be operated over time. At the building industry level, the Economic Input-Output (EIO) based LCA method is probably the best tool for completing an LCA. Instead of completing a process-based LCA of every building in the portfolio—not a realistic approach—an LCA at the building industry scale is completed by examining industrial production and economic output data. And so, for example, to characterize the environmental impact of the residential housing industry, surveys of homebuilders, housing start data, income of wood-products suppliers, property tax rolls, and construction employment data could be collected and analyzed to predict the amount of green-field land, non-renewable materials, and energy are directed into residential construction on a national or regional basis each year. In this way, an LCA of an entire segment of the AEC industry is created, but with little of the specificity found in process-based LCAs. The EIO LCA method has been used in the building industry to quantify the impacts of cement and steel production, suburban sprawl and urban densification, and changes in land use, for example. Gamage, G.B., Boyle, C., McLaren, J., 2008. Life Cycle Assessment of Commercial Furniture: A Case Study of Formway LIFE Chair. 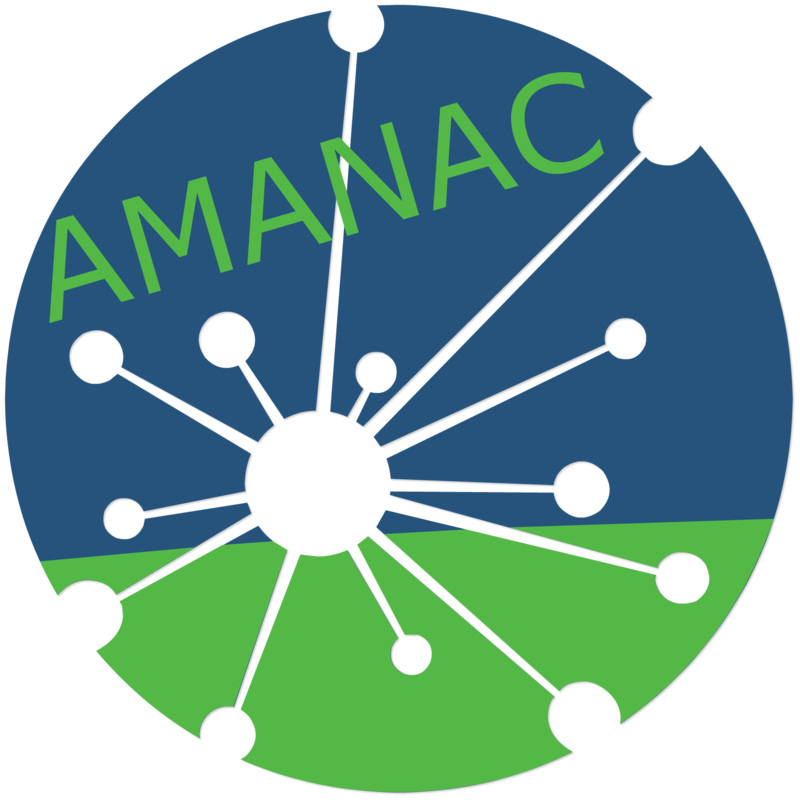 The International Journal of Life Cycle Assessment 13, 401–411. Georgia Institute of Technology, Bayer, C., Gamble, M., Gentry, R., Joshi, S., 2010. AIA guide to LCA Building in practice. The American Institute of Architects, Washington, DC 20006. Lippiatt, B.C., 1998. BEES 1.0: Building for Environmental and Economic Sustainability Technical Manual and User Guide. NISTIR 6144. NREL: U.S. Life Cycle Inventory Database Home Page [WWW Document], n.d. URL http://www.nrel.gov/lci/ (accessed 5.18.15). Van Geem, M.G., Nisbet, M., 1998. The Portland Cement Association’s Environmental Life Cycle Assessment of Concrete. PCA R&D Serial.